All projects are faced with challenges either in the design stage, the bidding stage or the construction stage. 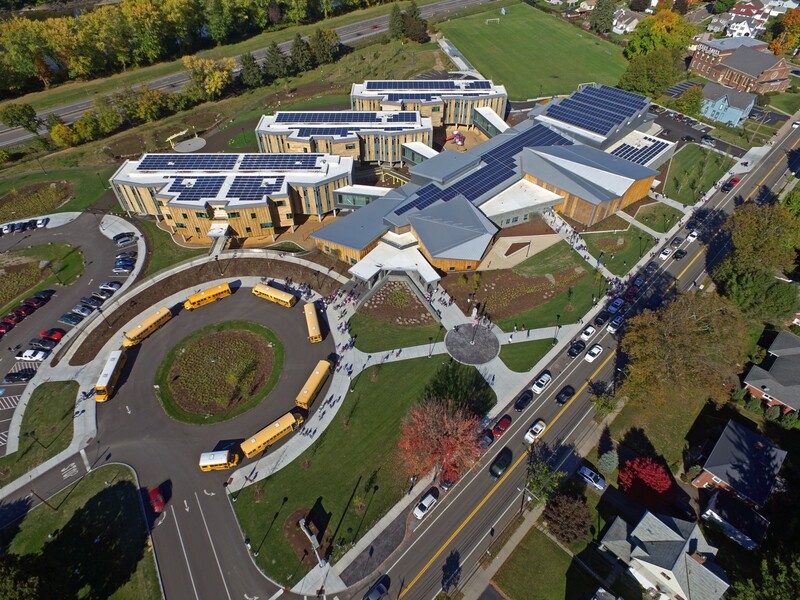 In the case of this project, the design implementation faced a challenge with respect to the NFPA 285 Fire Code and the NYS Energy code. 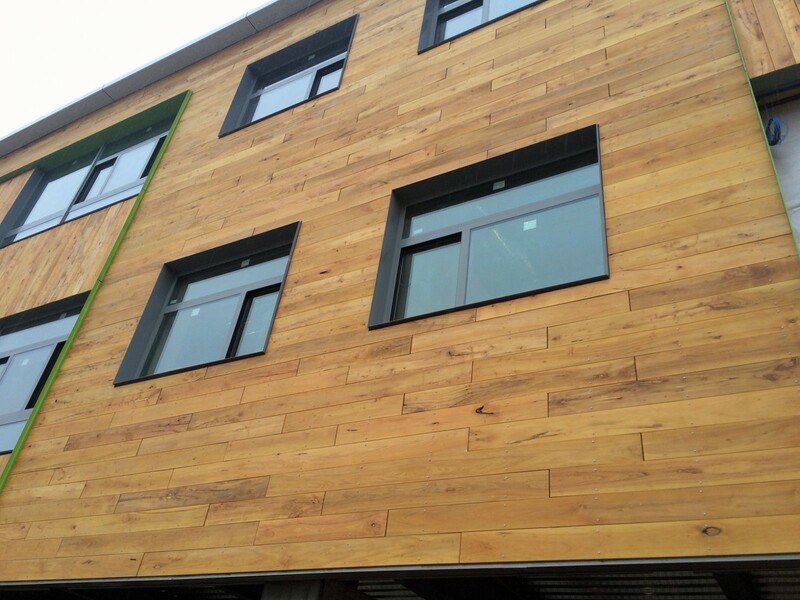 The designer wanted to clad this new school with real wood planks. 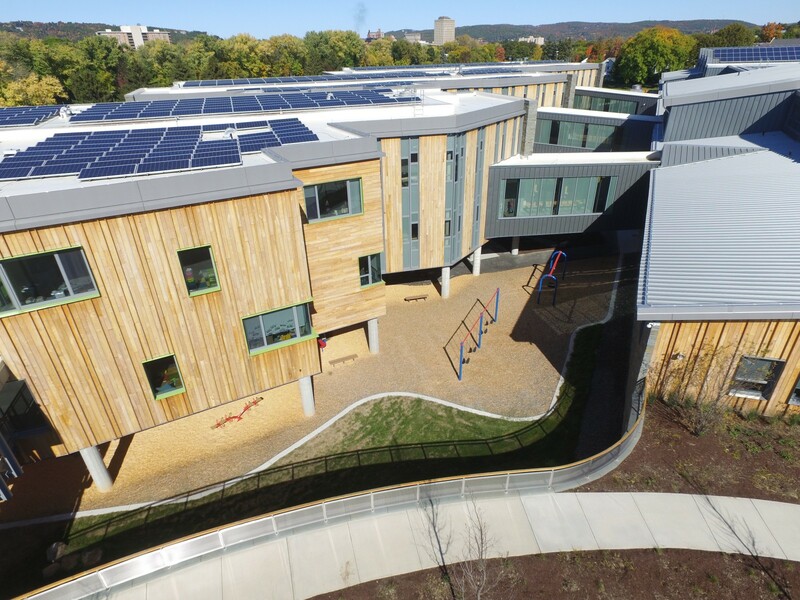 Typically, schools would fall into a classification of construction that would prohibit the use of real wood or non-fire treated wood on the exterior of the building. 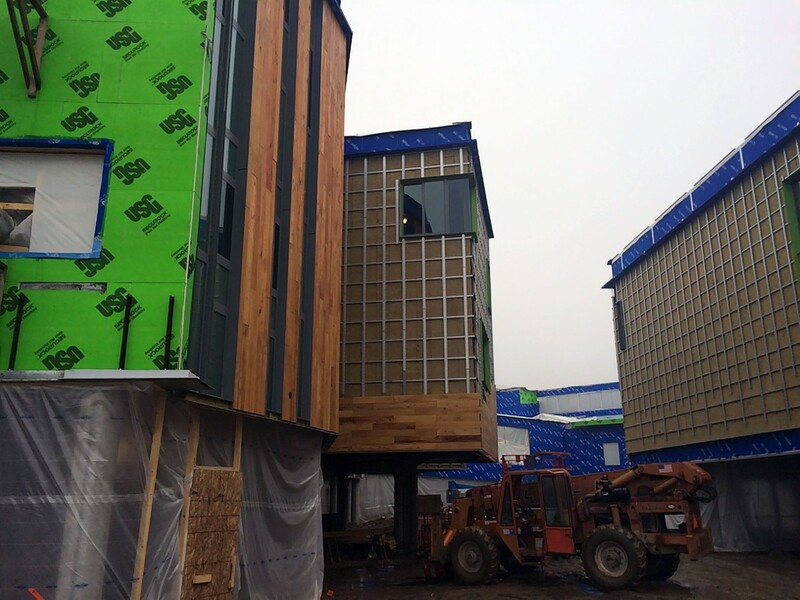 It was determiend that in order for the designer to use wood cladding, Black Locust in this case, they must meet the NFPA 285 Exterior Wall fire code. In turn, the energy code must also be met with the use of exterior insulation. CAS came up with a wall assembly that met both the NFPA 285 Fire Code and the NYS Energy Code. The wall assembly started with the air barrier. 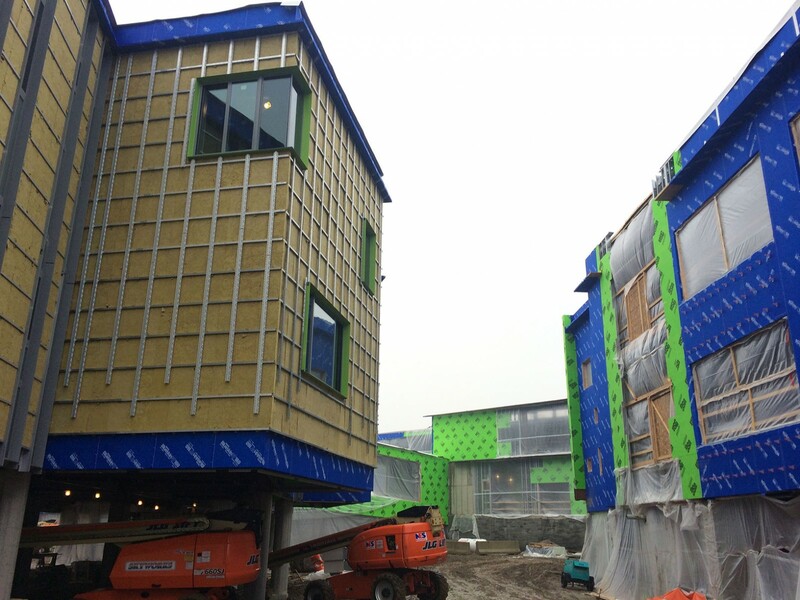 A vapor permeable air barrier was chosen to work with the exterior insulation and the designer’s feelings were to mate the permeable exterior wall insulation with a vapor permeable air barrier. Unfortunately, CAS was not awarded the air barrier on this job. The next component of the wall assembly was the exterior insulation. The only insulation that could be used on the exterior of the building in an assembly with real wood cladding was a mineral wool insulation. Mineral wool insulation is inherently fire resistive or non-combustible. The fire code dictates that a noncombustible insulation be used if a wood cladding is used on the exterior of the building. 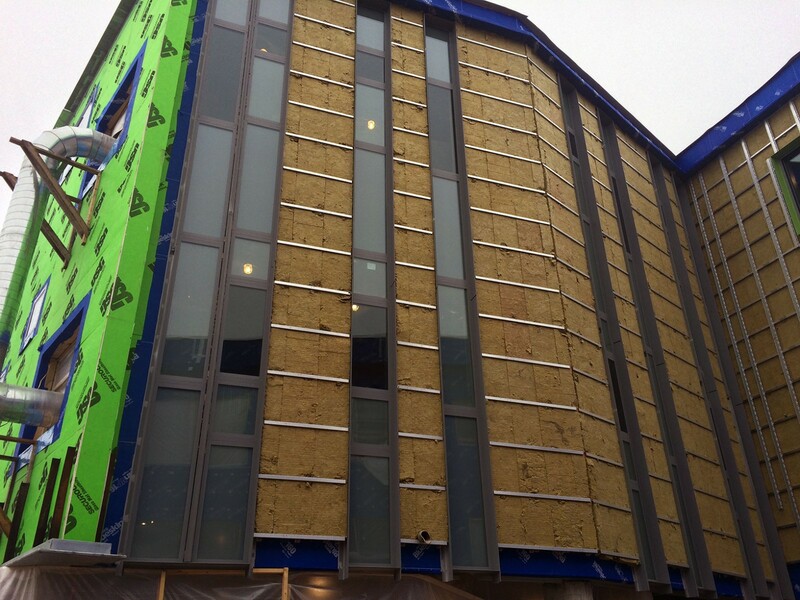 Thermafiber Rainbarrier 45 was the exterior mineral wool that was chosen for this project. Mineral wool on the exterior of the wall assembly will not meet the continuous insulation requirement; one of the prescriptive requirements of the energy code. However, the other prescriptive requirement of the energy code is to meet a U-Factor of .064. 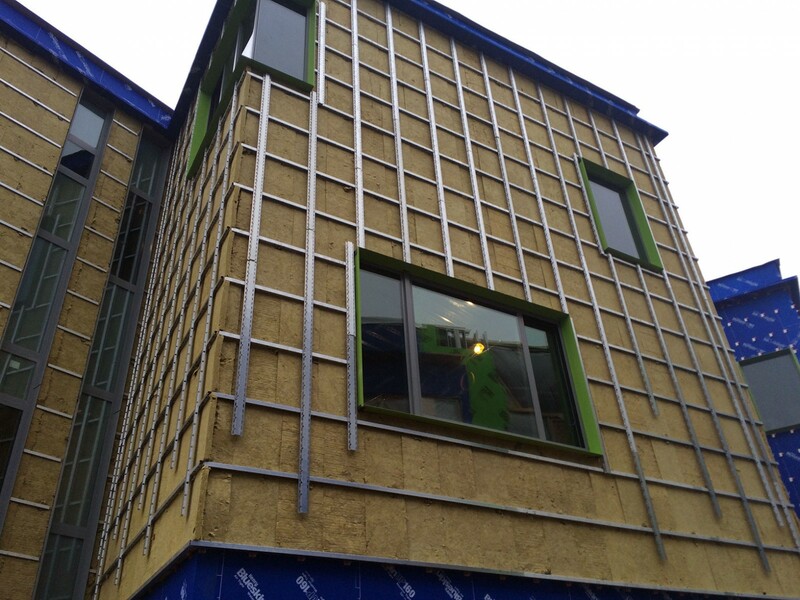 Utilizing a thermally isolated rain screen securement system for the cladding allowed the mineral wool in this wall assembly to meet the energy code. The Black Locust plans were secured to the Knight Wall Systems MFI securement system. Knight Wall manufactures thermally isolated securement systems for all types of claddings over rigid polyiso insulation or mineral wool insulation. A 4″ Knight Wall MFI bracket was used to overcome the mineral wool’s loss of R-Value that results with the thermal bridging of the traditional hat and Z-girt framing system of the past. The MFI bracket is manufactured in lengths of 2″ out to 6″ and even 8″ on a job-by-job basis. This project used 4″ and 6″ brackets to create some depth and reveals with the wood cladding.